Teloscopic OS is a cloud-based platform for modeling, storing and simulating visually meaningful data (e.g. all of the interactive whiteboard sessions) within an enterprise. It assumes that everything in a diagram represents enterprise knowledge and intent rather than mere pixels or lines on a board. As such, we have elevated diagrams from mere pixels to something more like a “visual program” that can understand and talk with the enterprise. Telos uses an adapted version of the Entity-Component-System design pattern from gaming. We call it ECO, where O stands for Oracle.Oracles are agents (software programs) that can programmatically interact with any visual entity within a diagram. In other words, pictograms in TelOS are actually more like programs with visual appearances. Due to their programmatic nature, elements in TelOS-hosted diagrams can interact with any type of system, from advanced rendering like AR to modern decentralized data systems like blockchain. And our streaming service is already compatible with common IoT protocols. A core principle of TelOS is that diagrams (and their elements) represent knowledge. The entire space of all diagrams built on TelOS constitutes a knowledge world. TelOS is a cloud-based computational platform that lets an organization treat all whiteboard diagrams as a single world of knowledge. The platform coordinates micro-services, called oracles, that reacts to whiteboard sessions to make them dynamic e.g. searchable, actionable etc. The platform has an unlimited concept of scale. In effect, all users could be considered to be actively building, editing and using a single massive-scale diagram. An oracle could be a single interactive whiteboard (UI) interacting with the knowledge world. Or it could be a background worker, like an AI, that is reacting to certain events, like “tell me who is interested in blockchain.”TelOS works by adopting a technology pattern similar to large-scale gaming worlds – the so-called ECS pattern. For TelOS, this is modified to what we call Entity-Component-Oracle (ECO) pattern. 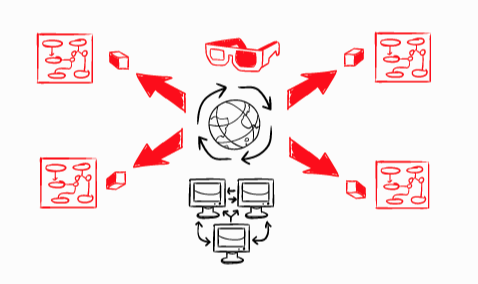 Oracles are independent software programs that can act on behalf of any visual element (pictogram) inside of a view. This is the key to turning visual aesthetic objects into knowledge. Telos.AI Inc. Made in California. All Rights Reserved.